thebittersweetpumpkin has no other items for sale. 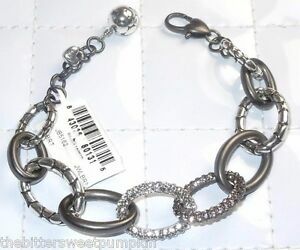 Details about BRIGHTON~PEBBLE PAVE~GUNMETAL CRYSTAL BRACELET~NWT~JB5162 RTLS $86~SPARKLE! BRIGHTON~PEBBLE PAVE~GUNMETAL CRYSTAL BRACELET~NWT~JB5162 RTLS $86~SPARKLE! NWTags! Brighton Petite Marvels Goldfish Bangle Bracelet. MSRP $48. SO CUTE!! Gorgeous line! No pouch but nicely wrapped.